The wearing of school uniform is strongly recommended and students should be encouraged to wear it to promote school identity and school pride. The school colors are blue and yellow. Macdonalds School Wear, at Jamison, is the preferred supplier of our school uniform. Purchases can be made either in store or online at MacDonalds SchoolWear website. When you order on line you can select to have the uniform delivered to the school (to your child's class or to be left at the front office) for free, to be picked up in store or delivered to another address for a small fee. 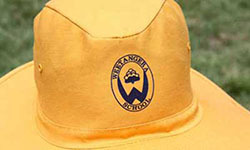 As our preferred uniform supplier, Weetangera Primary School receives commission on all uniform sales from Macdonalds. The Uniform Pool is a service provided through the school which is coordinated by a volunteer P&C member. We welcome and encourage all donations of quality second hand uniforms as these donations are essential in maintaining our uniform pool. Donations can be made at any time to the front office. For Term 1 the Uniform Pool will open weekly on Monday afternoons 2.30 - 2.50pm in the main hall, opposite the canteen. Any changes to this arrangement are advertised in the weekly newsletters. Sales are strictly cash only and items are $2 each, except for jackets which are $4.